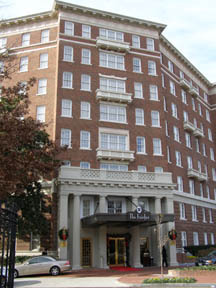 The Fairfax at Embassy Row in Washington, DC is a stunning luxury hotel that was once the childhood home of Al Gore. 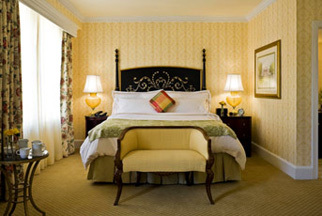 Conveniently located in prestigious Embassy Row, the hotel opened in late 2008 after a multi-million renovation, and is a welcome addition to the Washington scene. Built in 1924 in the Federal style with a brick façade, the 259-room hotel (29 are suites) is nestled among stately mansions that now house international embassies, and is a short stroll from the major sights of Washington, DC. The hotel is dedicated to creating an inviting ambience for its guests including being 100% smoke-free, is pet friendly, has a 24-hour Fitness Center, a 24-hour well-equipped Business Center which we used throughout our stay, has a special luggage program that allows guests to ship their luggage in advance, and the professional and courteous doormen are happy to provide a wealth of Washington, DC knowledge. 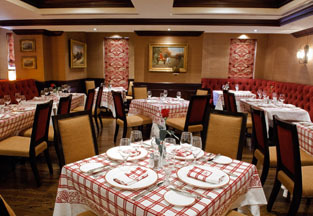 The hotel's elegant restaurant, The Jockey Club, is legendary, and has been "the place" for presidents, celebrities, and Washingtonians, and after having had a lovely dinner there with Edward F. Nesta during our stay in December 2008, it is destined to return to its elevated status. Executive Chef Richard McCreadie heads up the kitchen where he brings an international background into play, along with assistance from longtime Maître d'hôtel Martin Garbisou who has been an integral part of the restaurant throughout the years, and Sommelier Pierre-Yves Robin. A few of the highlights of our dinner at The Jockey Club included Yellowfin Tuna Tartar with Wasabi Aioli and Sesame Wafer; Long Island Duck Breast a l'Orange served with Wild Rice and Fennel Confit; Steamed Maine Lobster Tail served with Crabmeat Bisque and Snap Peas; and a lusciously decadent Grand Marnier soufflé. We had drinks by the roaring fireplace in The Fairfax Lounge where the atmosphere crackles with history, piano music charms, and the cocktail menu features innovative and classic signature cocktails a few of which include the Classic Manhattan (Kentucky Rye, Sweet Vermouth, Cherry Garnish); Champagne Violette (Champagne, Crème de Violette, Candied Violette garnish); The Ambassador Martini (choice of: Caddenhead, Old Raj 110 Gin, or Jean Marc XO Vodka, complemented with a Blue Cheese Stuffed Olive); and The Jockey Club Cocktail (Blue Coat Gin, White Cream de Cacao, and Fresh Lemon Juice). We stayed in an attractive two-room suite, which featured ivory dental molding accenting the beige wallpaper in the comfortable sitting room with a celadon, burgundy, and blue plaid chair in the corner, a celadon velvet sofa flanked by end tables with black lamps and ivory shades, a black coffee table held an assortment of magazines, a desk and chair were placed in front of the window dressed with ecru sheers and floral print treatments, and a spathiphyllum plant added a homey touch. A 42-inch LG flatscreen television was a focal point on the discrete refreshment center, which held a coffeemaker and Starbucks coffee, and a well-stocked mini-bar. The bedroom featured a two-poster black Federal style bed embellished with ornate gold swirls dressed with luxurious ivory 300-thread count Fili D'oro linens, an inviting celadon and cream floral print throw at the end of the bed, and celadon and ivory striped bedskirt. Amber etched leaf design lamps with ivory shades on the bedside tables picked up the colors of the gold, green, and ivory floral patterned carpet, and the window dressed with ecru sheers and a floral print treatment. Thoughtful extras included an iPod docking station with iHome radio and pewter Big Ben alarm clock in addition to the bedside cordless telephone. There was a celadon, burgundy, and blue plaid chair in the corner of the room, and a dresser held a 42-inch LG flatscreen television. Shopping in Washington is another favorite pastime of guests, at least for this guest, and the ample walk-in closet was well equipped to hold extra purchases, and featured a full-length mirror on the inside closet door, a safe, Frette robes and slippers, and an iron and ironing board. The marble bathroom featured beige floral wallpaper, a combination tub and shower, a large marble and wood vanity, an assortment of Gilchrest and Soames amenities, as well as a vanity/shaving mirror, scale, and hairdryer. From the convenient location of the hotel, we explored the neighborhood of Embassy Row including visiting the Woodrow Wilson House, which is Washington's only Presidential museum, as well as well as walking to see the historic sights of the nation's capitol. 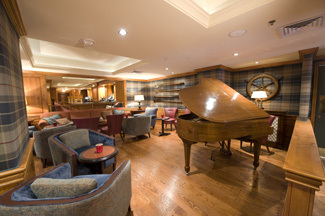 Whether you are planning a visit to Washington, DC for business or leisure, The Fairfax at Embassy Row is perfectly suited to attend to your every need. Read about The Jockey Club in the Restaurants section as well as in the Chefs' Recipes section where Chef Richard McCreadie shares a delicious taste of the restaurant until you can visit Washington, DC. Read more about Washington, DC in the Destinations section. For information and upcoming events taking place in Washington, DC, please visit the website: www.DestinationDC.com. © January 2009. Luxury Experience. www.LuxuryExperience.com All rights reserved.